Last month, Congress received two reports about the Department of Interior (DOI), Bureau of Land Management’s Wild Horse and Burro Program. One report was compiled by advocates and one report was compiled by the Office of the Inspector General’s Office (OIG), Department of the Interior division (yes, that means the DOI/OIG answers to the Secretary of the Interior). With respect to the advocates report above, I have been told the following information – though must confess – I cannot verify a single bit of it. Advocates had been in communication with Senator’s aides regarding their concerns about the BLM Wild Horse and Burro Program for well over a month prior to the reports release in early December 2010. The focus of these communications centered around not allocating the BLM any more money for roundups during the appropriations process that funds government budgets. During this phase of the interaction, they were told by aides that they were very excited about seeing what evidence and proof the advocates could bring to the table and were anticipating its completion. On December 1, 2010, the report was finally released to Congress and the Senate. Daily phone calls were made for over two weeks, requesting feedback, urging aides to read and verify the information, requesting information and status on the appropriations process, trying to find out information about the Senate Subcommittee on Interior, Environment and Related Agencies, which Senator Feinstein chairs, and getting concrete answers as to when the Subcommittee had reviewed the BLMs Wild Horse and Burro Program’s budget in 2010. And guess what happened after the Congressional and Senator aides received the report? Nothing….. The aides fell silent. Phone calls were no longer returned, emails not answered, and nobody could or would answer questions as to why the Senate never even looked at the BLMs WH&B Budget once throughout the entire fiscal year. The few responses that were received all said the same thing, “What does Feinstein’s Office say”? Apparently, Senator Feinstein has been holding the financial keys to the wild horse and burro kingdom and has now become the Pied Piper for the rest of the Senate and staff…. So, with no response from “our representatives”, the report was sent to at least 150 various news agencies and media publications. And guess what happened? Nothing…. Not one media outlet ever responded or even suggested they looked at the information in the report. 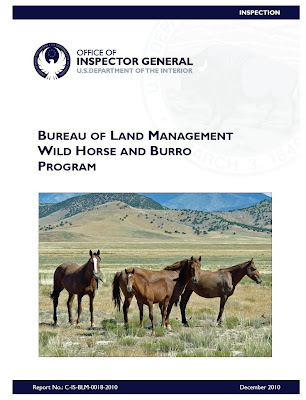 On December 13, 2010, the OIG released their report on the BLM Wild Horse & Burro Program. While the public will now find the OIG report plastered on every BLM website hailing its “findings” about the Wild Horse and Burro Program, which support in every possible instance both BLMs actions and overwhelming support for Secretary Salazar’s new initiative to decimate America’s herds, what the DOI won’t be telling the public about is what happened before the release of their final report. The information posted below is an effort to increase transparency about what occurred behind the scenes of the OIG report. Granted, the information is very limited and should be considered a starting point towards an investigation to uncover the truth, if such an animal even exists in the halls of D.C. anymore. It contains direct copies of emails received by me from the OIG during the time of their Inspection as well as personal notes regarding phone calls, information received second hand from others also involved during this process as well as some of my own comments and/or conclusions about what it all may mean. So without further ado, let the stripping of the whitewash begin…..
On February 9, 2010, I was contacted by a group of advocates and concerned citizens wanting my help in assembling a case to submit to the OIG’s office regarding the ongoing abuse and corruption occurring by the DOI in relation to the Wild Horse and Burro Program and multiple-use. I never saw any official communication from Feinstein’s office nor from Mr. Molinari that verified these statements were true. However, I have no reason to believe that those involved in this request fabricated it out of thin air. As a result, I sent a long list of information, links and documents to be forwarded to those coordinating this effort. I never received a concrete follow up from any of those within this group as to what they did with it, what response was received by Feinstein’s office, if any, or how this effort eventually ended. In August, 2010, an advocate unrelated to the original group relayed to me that they had heard Feinstein’s Office had requested the OIG investigation. As a result, they asked James Molinari if this was true and Mr. Molinari denied Feinstein’s office had requested an OIG investigation. On June 21, 2010, I filed a complaint with the Federal Bureau of Investigation (FBI) regarding all the complexities surrounding the Calico Complex wild horse removals. The focus of the complaint centered around reports that the BLM had removed approximately 400-500 more wild horses than they were authorized to remove and were now illegally auctioning off non-excess animals. I equated this with the unauthorized stealing of public property. I never heard from the FBI again, even though I sent a follow up request inquiring about the status of my complaint. The following is the complete series of email correspondence between myself and Loralee Bennett, Deputy Regional Audit Manager, Department of the Interior, Office of the Inspector General. I began communication with Loralee Bennett at the DOI Office of the Inspector General due to an email she initiated as a result of filing a complaint with the FBI. The following is Ms. Bennett’s correspondence. You filed complaints with the Federal Bureau of Investigations on the Bureau of Land Management's Wild Horse and Burro Program on June 21, 2010. Based on a Congressional Request, we opened an Inspection of that program on May 25, 2010. As a result, your complaint was forwarded to me for review as part of our overall Inspection. To get a better understanding of your concerns, we would like to set up a time to talk with you. In addition, we're interested in obtaining any additional information, documents, studies, etc. that you'd like us to take into consideration as we conduct our Inspection. I've included all my contact information below and I look forward to hearing from you. Thank you for contacting me regarding my concerns about the BLM Wild Horse & Burro Program and I appreciate the opportunity to share them with the Office of the Inspector General. Regarding scheduling a time when we can discuss these issues, I will make myself available any day next week, beginning Monday, August 2, 2010, from 12:00 p.m. p.s.t. through 3:00 p.m. p.s.t. Please pick a time that is equally convenient for you during this time frame and I will confirm. With respect to submitting additional documents, studies, data, etc., I have a vast amount of information I could potentially share with the OIG, so much so that I am concerned it could overwhelm you and/or your staff. Consequently, in order to best streamline our efforts and time, perhaps you could better define the purpose of the Inspection and what types of information you are seeking to help me narrow the scope of your interests. Also, I have a specific concern I would like you to address prior to any submissions, just so I am very clear as to what happens and the resulting status of any information submitted to the OIG. Based on my understanding of what happened last time the OIG was involved in an Inspection of the WH&B Program, the DOI/BLM was able to use the OIG Inspection as a blanket reason to withhold information from the public about their activities, evoking some sort of clause about not being able to disclose information until the investigation was complete. For the record, I have seen no evidence of the DOI/BLM doing this so far. However, I am working on a variety of issues affecting wild horses and burros and do not wish to compromise my ability to obtain additional information due to “partial” submissions to the OIG that could possibly result in an informational “lockdown” by DOI/BLM. Therefore, please address the issue of potential impacts, if any, of submitting information, data, documents, etc. to the OIG and either confirm or deny the possibility that the DOI/BLM may be able to use your Inspection of a particular subject as reason to withhold information from the public about their activities until the Inspection is complete. Finally, I would like to know the current deadline for submitting information and the approximate time frame the OIG is projecting they will release the results of the Inspection. The relevance of this question is, I was also involved in submitting information during the GAO inquiry in 2008. During the GAO process, they stopped accepting any additional input around May and spent the next three months preparing their report. Having a sense of how much information the OIG can absorb and sincerely review will give me a better idea of what to submit so as not to waste our time. For now, I have attached a few items for your review and consideration. Thank you again for contacting me and am looking forward to talking with you. Loralee sent the following unedited response. It was no longer addressed to me personally as two other advocates were now included in the correspondence, nor did she ever again reference speaking with me personally about my concerns that initiated the FBI complaint or address any of the questions I had posed above. Does this mean that you are no longer interested in setting up a time to talk with me about my concerns – unless I can fly to Colorado to meet you personally? The next correspondence received by Ms. Bennett now included a handful of additional individuals and various organizations known to be involved in wild horse and burro advocacy and/or issues. Michael Golembeski of the WindDancer Foundation provided me with each of your e-mail addresses and requested that I contact each of you related to our ongoing inspection of BLM's Wild Horse and Burro Program. I know I have e-mailed many of you, and spoken with a few of you on the phone, about concerns that you have with the Program (and I do have 3 phone messages I need to return). However, for some of you, this may be the first time you've heard from me so let me give you a little background. Based on an e-mail from a Senator's staffer and pending legislation, our IG decided to implement an inspection of BLM's Wild Horse and Burro Program. We are looking at every phase of the Program as it currently operates (visiting HMAs, attending gathers and adoption events, visiting both short term facilities and long term pastures, etc.) as well as evaluating the "studies," "science," and "other" support behind its current policies and procedures. While we are both (1) talking with BLM and reviewing the documentation, studies, etc. that it has and (2) performing as much independent research as possible, we want to be as fair, objective, and inclusive as possible. Therefore, we are also interested in hearing from each of you about any studies, research reports, scientific papers, etc. that you're aware of that provide insight into either how BLM currently operates - or how you think BLM should operate - the Program. We would also be interested in any suggestions you might have about improving the Program. Any such information and/or recommendations you'd like OIG to review and/or consider can be e-mailed to me at the address below. Unfortunately, we need to cancel the meeting we had scheduled in Denver CO for August 23. Despite being forced to cancel the meeting, we are VERY interested in your perspectives and in reviewing any documentation, studies, etc. that you have to ensure that we have the most complete and accurate picture of the Program as possible. We need to cancel the meeting because, as we enter the end of the fiscal year and face a possible continuing resolution, several competing priorities have arisen that have required us to take a serious look at what work can and cannot be completed on numerous ongoing reviews. Our priority on this Inspection is to attend as many gathers and visit as many holding facilities as possible in the time we have remaining to complete this inspection. Additionally, these competing priorities have required me to be in Washington DC extensively over the last several weeks (hence the reason I owe 3 of you return phone calls). I had thought I'd be back in Denver the week of August 23rd but, these trips to Washington DC are expected to be required until at least mid-September. Therefore, unfortunately, we have no one available to conduct a meeting before our report is scheduled to be completed. Thank you in advance for any information you can provide that will help us ensure this report is the most complete and accurate assessment of the Program possible. Given my extensive travel schedule and multiple priorities, it is often difficult to contact me on the phone. Therefore, the best way to contact me is via e-mail. Each day (sometimes not until mid-night but ...) I do my best to get through all the e-mails I received that day - something I can't always do with phone messages. Thank you for this additional info and update. How is it that the IG is expected to perform a thorough review of the complex and long standing issues concerning the Wild Horse & Burro Program when it is obviously understaffed and given too short of a deadline to accommodate a serious and in-depth investigation? Or is that perhaps the plan - to prevent an in-depth investigation from occurring? In my last email communication, I had asked you to address the issue of "the scope" of what the IG was mandated to review so that I would not inundate you with information that fell outside the parameters of the investigation. However, since this response seems to cover "everything", then that is what I will submit. I apologize in advance if these submissions may prove to be a bit overwhelming - but I have been studying this Program, day and night, for over four years now and have accumulated quite a bit of information that may have relevance. I will also try to organize them as best as possible but due to the sheer volume of documents I would like to submit, some may come in rather rag tag due to time constraints. From this point on, I submitted multiple documents, links, reports and information to Ms. Bennett totaling nineteen emails beginning on August 19th through 31st, 2010. A complete list of what I sent the OIG is included at the bottom of this post. I received a "group" email from an advocate who introduced herself as Susan addressed to myself and others involved in wild horse and burro issues. Susan alerted us to the fact that the OIG was conducting an Inspection of the WH&B Program. The following quotes received during her alert have been edited for relevance. “I have learned today that the OIG is preparing another investigation into the issue of inhumane handling by BLM, but they must amass a body of evidence---video, photos, testimony of observers, etc. and this must be submitted ASAP. They want the report ready for Sept. Mr Kris Kolesnik, associate inpector general for External Affairs, is the man I spoke with. He said no one has to have any 'professional' standing i.e. be a vet or official, just have personal or photographic documentation”. “Please, any of you I am writing, send whatever you have for conducting this expose' on BLM's lack of humane treatment. I am just a interested horse advocate, but I know the damning lack of scientific data to back up their claims and the exposure of their methods of handling are the weak spots to attack”. Because of this information, I also forwarded each email sent to Loralee about the Wild Horse and Burro Program to Kris Kolesnick as well. I also followed up by calling Loralee to ask for confirmation as to whether another Inspection had been initiated merely to focus on the gathers and humane treatment or if this was the same investigation that had been opened on May 25, 2010. I left a voice message and requested either a return phone call or an email to answer this question. I received no response. Throughout this process, Michael Golembeski of the Wind Dancer Foundation and I communicated rather frequently about progress, questions and information related to the OIG Inspection. According to Michael, Deputy Bennett and he communicated quite regularly as well. He relayed to me around the end of August, early September that the OIG was in the process of completing their report and it was expected to be released before the end of the fiscal year, which would be on or before September 30, 2010. Michael’s information matched what Susan had said; the OIG intended for their report to be ready by September. b) they were going to spend their remaining time in the field and not actually auditing the Program. I saw Ms. Bennett’s request for information as outlined in her last email - despite admitting they would not make its review a priority - as just a way for the DOI to get the advocates attention away from more meaningful work and to see what advocates might be holding in terms of information that the DOI could develop a counter strategy too. According to Michael, in the last phone communication he had with Deputy Bennett, she relayed that the OIG had begun to review the BLMs new Wild Horse and Burro Policy Manual and had run into some problems. What they were, she didn’t say. From this point on, Loralee became inaccessible and never returned his phone calls or emails again. Throughout September, Michael checked the OIG website and each day, no report was posted. As we now know, it wouldn’t be released for over two more months – just days before Congress and the Senate were to vote on the BLMs Wild Horse and Burro Program’s budget and whether they were going to give Salazar millions to purchase private lands for the Salazoos. With all the additional work associated with the Special Assignments put on my desk, management of the Wild Horse and Burro Program Inspection has been transferred from Central Region to our Western Region Office. 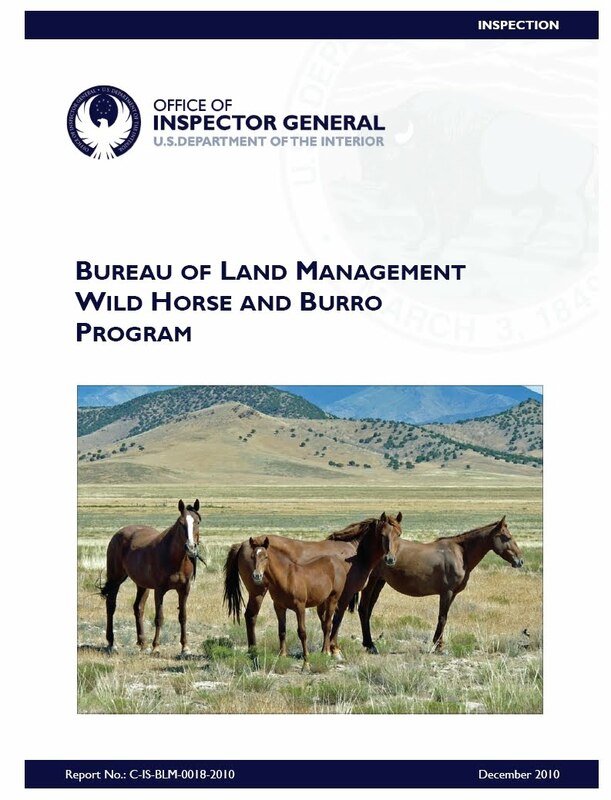 Therefore, any questions on the Wild Horse and Burro Program Inspection should be directed to either the Western Region Regional Manager (Mike Colombo) or the Western Region Deputy Regional Manager (Chuck Wiebe). The number at the Western Region is (916) 978-565x. From here, Michael reported he contacted the Western Region Office personnel provided by Loralee’s email. While I cannot verify this personally, Michael relayed to me that his contact with them was greeted by both surprise and criticism as they stated he was not to contact an OIG inspector directly. The Western Region then referred him to a Public Affairs Specialist in Washington D.C., to which all future public communication would be funneled. When Michael asked why the Inspection had suddenly been transferred to the Western Region, the response was something to the effect of, “The Inspection was always being conducted by the Western Region and Loralee was just a point of contact.” As to Michael’s concerns that everything formerly sent to Ms. Bennett was also included in the Western Region Office Inspection, he was assured all information had been received and would be considered. On December 13, 2010, the DOI/OIG publicly released their long awaited report. Instead of following the general outline described by Deputy Bennett in prior communications, which was to include all phases of the Wild Horse and Burro Program, what the pubic got was an official propaganda piece extolling the virtues of Salazar’s new Program and the parroting of an overpopulation problem that continues to be unsupported by the BLM’s own records and statistics. The “objective” now seemed a far cry from what its original purpose was as previously outline by former lead, Deputy Regional Audit Manager Loralee Bennett, whose last communication now sported a new title of “Head Quarters, Special Assignments”. So in efforts to try and nail down a definitive answer to these two conflicting stories, I submitted a Freedom of Information Act Request (FOIA) to the DOI OIG requesting the source document of who initiated the Inspection. 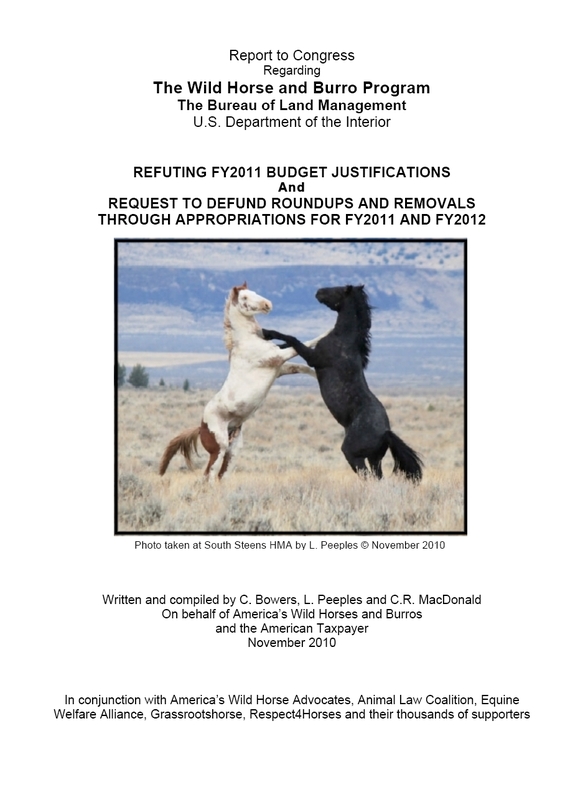 This is a FOIA request for information related to the Office of the Inspector General, U.S.Department of Interior, Bureau of Land Management, Wild Horse and Burro Program,Report No. : C-IS-BLM-0018-2010, released December 2010. The specific request is limited to only include the document(s) or email communication(s) identifying the source of who officially requested an investigation be initiated into the BLM WH&B Program, including the date of submission, as well as their description of the parameters to be covered in the investigation. Due to the limited size of the request, most likely spanning merely one or two documents and/or emails, it is believed this request will fall within the fee waiver parameters. However, if not, the fee I am willing to pay is up to $30.00 dollars. Also, I would prefer this request be provided in electronic format but will accept any format that is compatible with supplying the requested information. Upon receipt of this FOIA request, please provide a FOIA response number to the email address listed above. If you have any questions or issues you'd like to discuss, please feel free to contact me at any of the above provided contact information. The next day, the following response was received by the DOI/OIG FOIA Office…. I have received your FOIA request in which you state you are seeking a "specific request is limited to only include the document(s) or email communication(s) identifying the source of who officially requested an investigation be initiated into the BLM WH&B Program, including the date of submission, as well as their description of the parameters to be covered in the investigation." Normally with an investigative report there is a specific complainant that we use to justify an investigation, this particular report happens to be an audit report which was a general response to public outcry. Therefore there isn't a specific event, for example a singular letter, phone call, or e-mail that started this process. If there is anything else I can help you with please do not hesitate to contact me. For your convenience the link below will bring you to our electronic copy of the audit report you seek. According to Loralee’s first email communication, the Inspection was initiated based on a Congressional request. She further added at a later time that the Inspection was, “based on a Senator’s staffers email”. Was that staffer James Molinari of Senator Feinstein’s Office? Senator Feinstein was the Chair of the Subcommittee responsible for overseeing the BLM WH&B Program and budget allocations, so it seems logical to me that she has a direct interest in obtaining a review by the OIG. And maybe that would explain why she never brought the budget issues of the WH&B Program to the floor once for discussion throughout 2010 - because she was waiting for its results first. But Mr. Molinari denied Senator Feinstein’s Office initiated the investigation. So who WAS the Senator’s staffer that requested this Inspection Deputy Bennett referenced? But now, it would appear that the DOI/OIG FOIA Office is denying the existence of either a Congressional request or a staffers email, claiming this was their own idea, a response to “public outcry”, and finally, that the parameters of the Inspection were only limited to the necessity of roundups and humane treatment. Well, based on what limited evidence I have seen, here is what I think the evidence points too. James Molinari DID submit a query to the OIG as indicated by the group of advocates in February 2010. This resulted in an Inspection being officially opened in May that Loralee attempted to revolve around the parameters she originally outlined; the whole WH&B Program was on the table for review. As information began coming in, Interior Secretary Salazar and various high ranking officials began blocking the Inspection, piling on additional workloads on Loralee in efforts to bury her, began manipulating the Inspection from behind the scenes and finally, took it out of her hands completely and transferred it to the more “friendly” Western Region. Here the process began of doctoring the OIG report to read like a Salazoo advertisement now officiated by “expert review". Why would James Molinari deny the Inspection was initiated by Feinstein? Well, maybe one of those famous Congressional deals was struck at the back of the House. Salazar gives Feinstein what she wants and Feinstein turns her head regarding both the budget and the OIG Report. There is currently a lot of DOI related proposals on the table in California…. Did this really happen? 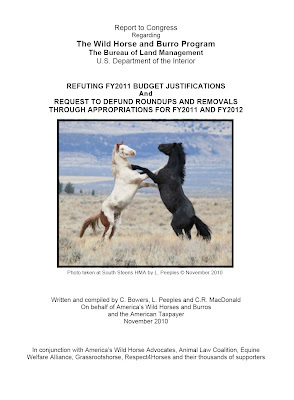 Did a conspiracy occur behind the scenes of this report to whitewash the truth, tamper with the Inspection and prevent a real audit of the Wild Horse and Burro Program? Go back and read these emails again and you tell me what YOU think happened here. Is this enough evidence to indicate an investigation should be opened regarding the DOI/OIG’s handling of this affair? And if so, who investigates the investigators? America's Mustangs & Burros: What's Left, The High Cost of Miscalculating and Will They Survive? Part II, Financial I. pg. 35. Nevada Commission for the Preservation of Wild Horses, April 7, 2005 Meeting Minutes. NOTE: The 1999 Lincoln County Elk Management Plan is too big of a file to provide via email.